March 17th marks St. Patrick's Day, the religious holiday commemorating Saint Patrick, the foremost patron saint of Ireland. It has also been internationally linked to the celebration of Irish culture in some parts of the world. For Boston, St. Patrick’s Day is observed annually with a parade that takes place in South Boston, the city's predominant Irish-American neighborhood. The parade has been a tradition in South Boston for more than 110 years, with the first procession taking place in 1902. It includes various marching bands, police and army contingents, costume spectacles, novelty vehicles, and a general "green" atmosphere due to participants and onlookers wearing green hats and accessories to reflect the association of the color with Irish culture. Saint Patrick lived in the 5th century. He was captured as a boy in Wales and enslaved in Ireland, only to escape after 6 years and return to his homeland. He wrote that his faith grew during his captivity in Ireland, working as a herdsman. He returned to Ireland as an ordained Bishop. He was among the first and foremost missionaries to spread Christianity to a largely polytheistic Irish people at the time. There are two documents in existence that were possibly written by St. Patrick himself detailing some accounts of his life. He is also credited with using the shamrock, a three-leafed plant, to show the locals of Ireland about the blessed trinity. This is why Saint Patrick's Day includes shamrocks as a common symbol in its celebrations. March 17 marks the day of his death. The parade includes contingents from the Boston Police, US Army and armed forces, government officials and politicians, Veterans, local schools, and various other public organizations and institutions. In previous years, there have been costume displays, with some participants donning the uniforms of 19th century armies. Some people wore costumes that included more modern themes such as Star Wars, complete with Jedi and storm troopers, Ghost Busters' characters, and the tin man from the Wizard of Oz. You can also expect a variety of novelty vehicles such as miniature trucks, authentic army vehicles and other well-decorated cars and vans. Marching bands are a mainstay of course. The parade is a celebration of Irish culture in Boston. 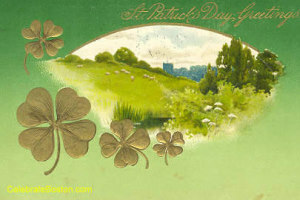 There is a festive atmosphere and all the observers, even those of non-Irish descent, get to participate by either wearing a green hat or by simply attending the event. Along with the festive atmosphere, however, there is a prevalence of alcohol consumption, which is to be expected in any big feast or gathering. This fact, however fun it is for the consumers of alcohol, can sometimes cause the crowds to be a bit rowdier than usual, prompting the organizers to make sure there is enough staffing by the police to keep things under control. Beginning in 2006, even with the risk of getting less income on the big day, the bars in South Boston close early (as early as 6:30 pm or so) to minimize the mayhem right after the parade finishes and the “merry-making” begins. Aside from being St. Patrick's Day, March 17th is also celebrated as Evacuation Day, when British forces abandoned Boston in 1776 after an 11-month siege. Dorchester Heights (South Boston) was fortified with cannon dragged through snow and all the way from Fort Ticonderoga in New York. The Continental Army was led by General George Washington, but it was Colonel Henry Knox that was given the assignment of transporting the cannon from New York. Knox and his men dragged 60 tons of cannon and other weapons, over the course of 3 months, in harsh conditions, by boat, horse and sheer manpower through rough roads, frozen rivers and other natural barriers, all the way to Dorchester Heights. This was such a magnificent feat that a monument was created at Thomas Park, where the parade passes by, to commemorate this event. Once fortified, Dorchester Heights presented a strategic advantage as British warships could be bombarded from this vantage point, protecting the town. Dorchester Heights and vicinity was annexed by Boston in 1804, and became known as South Boston. The parade starts on West Broadway (12:00 pm) at the intersection with Dorchester Avenue. It continues southeast up East Broadway towards the sea. It then turns right at P Street and goes down East 4th Street, turning left on K Street, and then right onto East 5th Street. Then a left on G Street, and a semi-circle around Thomas Park (Dorchester Heights) and down Telegraph Street. The parade continues left onto Dorchester Street, and ends at Dorchester Avenue. The best viewing areas are on East or West Broadway, although the crowds are larger here.